Q Acoustics Q-BT3 wireless speakers take aim at soundbars | What Hi-Fi? Streaming music from a smartphone, tablet or Bluetooth-enabled computer seems like the most obvious use of the speakers, with the addition of support for the superior aptX codec hopefully delivering better sound from aptX Bluetooth devices such as the HTC One and Samsung Galaxy S4. Thanks to a 3.5mm input and a stereo phono input you can also connect any other source with an audio output, such as a TV, set-top box, Blu-ray player or games console. An integrated DAC and an optical digital input means you can also take a digital signal from compatible sources. There's a subwoofer output, too. Q Acoustics is eager to stress the Q-BT3 speakers are hi-fi speakers not "a jazzed up iPod dock or modified table radio in disguise". The system has one powered speaker and one passive 'slave', with standard speaker cable joining them together. The speakers use a 25mm silk dome tweeter and 10cm paper mid/bass driver, while the amp delivers 2 x 50 watts of power. 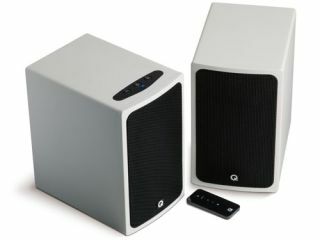 The Q-BT3 speakers are nice and compact, measuring 24 x 14.8 x 22.6cm (HWD). Available in black, red and white, the Q Acoustics Q-BT3 wireless Bluetooth speakers are due on sale in late August 2013, priced £399 per pair.